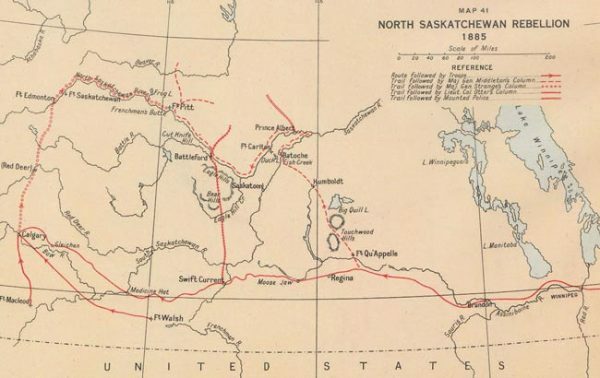 The seeds of the 1885 Northwest Resistance began as early as the 1870s, with the lack of Métis representation in the government of the North-West Territories (which included present-day Alberta and Saskatchewan). Even after representation was granted in the 1880s, the Métis remained frustrated that the federal government did not address their many petitions regarding their lack of formal title to their lands and their desire for proper political representation. The Métis desperately wanted title because they did not want to be dispossessed like they had been in Manitoba following the Red River Resistance (1869-70). Map of the North Saskatchewan Rebellion area from 1885. The lack of a clear response to their numerous petitions made the Métis further determined to press the government. In the winter of 1883-84, Charles Nolin and Maxime Lépine organized a committee consisting of the leading Métis inhabitants of the Lorne district, North-West Territories. These Métis leaders held several meetings in which they sought ways to recognize their rights as a people, drew up a list of grievances and voted in favour of sending a delegation to Ottawa. They also resolved to bring Louis Riel back from the Montana territory. In the summer of 1884, Bishop Grandin brought a petition to Prime Minister Macdonald that outlined the Métis’ grievances. In the petition, the Métis demanded that the North-West Territories, which were governed by a federally appointed council, become a province with a fully responsible government, that the Métis be granted full title to their lands, that these lands be surveyed to recognize the Métis’ river lot land-holding system, and that Louis Riel’s leadership be formally recognized, either through his appointment to the territorial council or to Canada’s Senate. In December 1884, Louis Riel drafted a new petition, which had the same principles as the preceding ones, but was more urgent in tone. The government responded in January 1885, saying it would not negotiate with Riel and would only consider the Métis’ demands if these were presented at the proper time and place. Louis Schmidt and other Métis felt that this response by the federal government precipitated the outbreak of the 1885 Northwest Resistance. On March 18, 1885, the Batoche-area Métis established a provisional government with Pierre Parenteau Sr. as chairman, Philippe Garnot (a French-Canadian) as secretary and Gabriel Dumont as the adjutant-general or military leader. Louis Riel also set up a 20-member people’s council called the “Exovedate” (a made-up word based on Latin for “out of the flock”). The Battle of Duck Lake as depicted in an issue of The Canadian Pictorial & Illustrated War News. On March 25, 1885, Gabriel Dumont asked Louis Riel to let him take 30 men to gather supplies from the stores of those merchants who opposed the Métis’ resistance against the federal government. They rode to Hillyard Mitchell’s store near the community of Duck Lake and appropriated its contents. Riel then told Mitchell to keep track of everything that the Métis took. North West Mounted Police Supt. Leif Crozier was warned that the Métis were likely going to occupy Duck Lake. However, he was unaware that this had already occurred. He sent 15 mounted police and seven armed volunteers from Prince Albert under the leadership of Sgt. Stewart and Thomas McKay with a number of sleighs to get provisions from Mitchell’s store. Gabriel Dumont, along with an estimated 30 Métis and some First Nations warriors, intercepted the police. Dumont knocked a policeman over with the barrel of his gun, and had a shouting match with Thomas McKay. Sgt. Stewart decided to retreat to Fort Carlton because they were outnumbered. The Métis returned to Duck Lake, but barely had time to feed the horses when the police returned. Crozier decided to attack the Métis with 56 Mounted Police and 43 Prince Albert volunteers. Crozier also had a seven-pounder cannon at his disposal. News of the first encounter between the Métis and the police and the Prince Albert volunteers reached Batoche and St. Laurent. At this point, the Métis received reinforcements. The Métis had 250-300 men, which included some Cree from two nearby reserves. 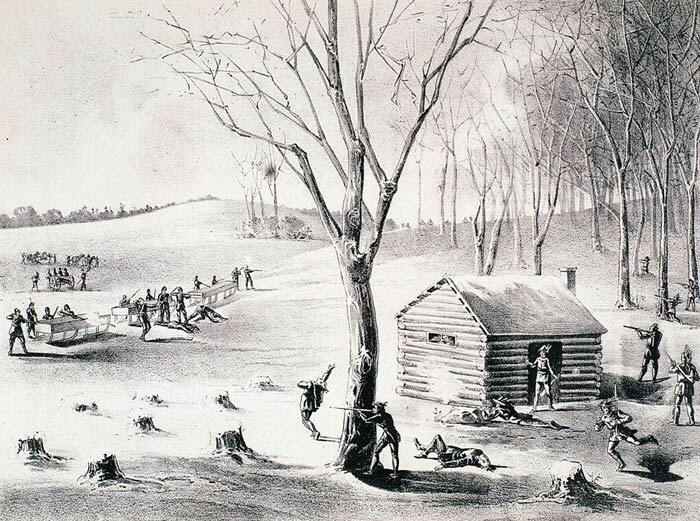 On the early morning of March 26, Gabriel Dumont took 25 men to set up an ambush. He chose a spot 3.5 kilometres from Duck Lake where the land overlooking the road was low, with plenty of low bushes, a gully and a log house, which was immediately occupied by a few men. Some of Crozier’s scouts were English Métis who were familiar with prairie warfare and detected Dumont’s plan. Crozier ordered his men to halt and prepared a mounted barricade and armed his cannon. The Métis formed a semi-circle to attack the police on both flanks. At this time, Louis Riel led a force of Métis reinforcements. Isidore Dumont and Assiyiwin—an elderly half-blind Cree headman—moved towards Crozier’s men waving a white blanket. Joseph McKay, an English Métis interpreter, moved to meet them, with Crozier following behind. Assiyiwin, who was unarmed, began to speak Cree to McKay. Assiyiwin reached for one of McKay’s guns and McKay fired, killing the elderly man. Crozier ordered his men to fire, and Isidore Dumont was also killed. McKay and Crozier barely made it back to the rest of their men before the Métis started firing from all sides. Crozier’s cannon was disabled early in the fighting because the gunner put the shot in before the powder when he loaded it. This part of the battle lasted only a half hour. The police retreated into a clearing where the Métis ambushed them. At this point, Gabriel Dumont was grazed in the head by a bullet and fell from his horse and was unable to get up. However, he continued to motivate his men. He gave his rifle and his cartridges to Baptiste Vandal, while Joseph Delorme stayed by his side. During the height of battle, Louis Riel rode a horse and held up a crucifix. Auguste Laframboise died beside him. The police began to flee. Gabriel Dumont’s brother Édouard wanted to pursue them, but Louis Riel ordered the bloodshed to stop. The Métis lost five men: Isidore Dumont, Assiyiwin, Jean-Baptiste Montour, Joseph Montour and Auguste Laframboise. The Métis also had three men wounded, including Gabriel Dumont. The police and volunteers lost 10 men and had 13 wounded, two of whom became additional fatalities. 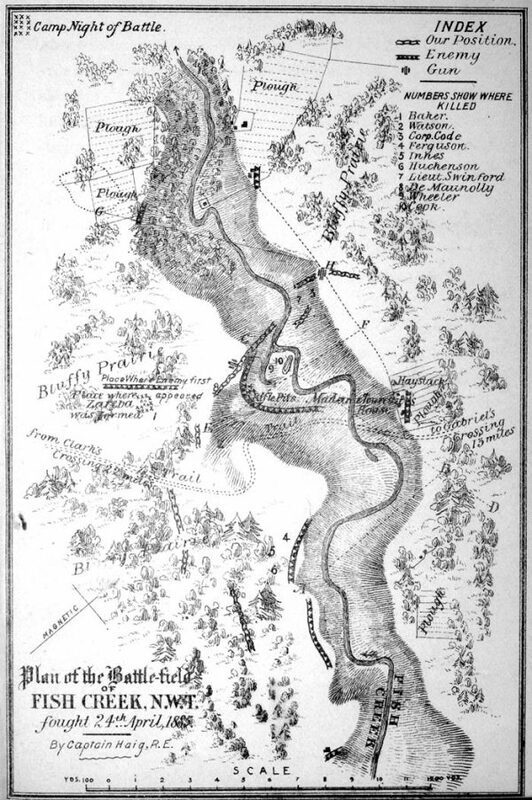 Sketch plan of the battlefield at Fish Creek from April 1885. After the Battle of Duck Lake, the federal government, fearing a large-scale Indigenous uprising, sent the Canadian troops and militia, as part of the North West Field Force under the control of Gen. Frederick Middleton out west. Middleton and his men stopped at Qu’Appelle, Sask. With 800 men under his command, Middleton began his march to the Batoche area in early April 1885. On April 23, 1885, Gen. Middleton moved his forces from Clarke’s Crossing, which was only a few days’ march away from Batoche. That night, Gabriel Dumont’s scouts told him that the Canadian troops were camped at the McIntosh Farm, which was about 10 kilometres south of Fish Creek. The Métis decided to ambush Middleton’s marching forces at Tourond’s Coulee, which was a ravine that twisted from Tourond’s farm towards the South Saskatchewan River, down to where Fish Creek ran into the river. It was the perfect place for an ambush because Métis marksmen could be placed in the creek bed and on its slopes and they could also monitor the road down to the ravine. They were also well-camouflaged—the low thick woods at the start of the bridge would have prevented the soldiers from seeing the Métis. Late on the evening of April 23, Louis Riel and Gabriel Dumont set out for Tourond’s Coulee. Gabriel’s brother, Édouard Dumont, was left to guard Batoche. Noël Champagne and Moïse Carrière warned Riel and Dumont that the North West Mounted Police were about to attack Batoche by surprise via the Qu’Appelle road. Upon hearing this intelligence, Louis Riel decided to leave with 50 men to reinforce Batoche. The remaining Métis force at Tourond’s Coulee would be less than a fifth of the size of the Canadian force they faced. At 7 a.m., Gilbert Bréland warned that 800 soldiers were advancing. Gabriel Dumont then placed 130 men in a hollow on the left bank of Fish Creek, hid horses in the woods, and went with 20 men farther down the creek’s pathway. He ordered his men not to attack until all of Middleton’s troops were in the coulee; then the trapped soldiers could be shot at like bison. At Tourond’s Coulee, the Métis had many superb marksmen, such as Philippe Gariépy, James Short, and Gilbert Bréland, but they also had many inexperienced youth. Some Dakota fought alongside the Métis as well. Middleton’s English Métis scouts said that the Métis were well-armed with repeating rifles, but many only had shotguns or muskets. The Métis had only three or four Winchesters (breech-loading repeating rifles). The fighting started at 9 a.m. Some of Gabriel Dumont’s men fled the battle, but Dumont decided to set an example by shooting at all available targets. When the soldiers started firing directly at him, he galloped back, with Napoléon Nault, to a position higher up the ravine, where the rest of the Métis forces were located. At this point, Dumont stopped 15 of his men from deserting. However, only 47 of the original 130 Métis remained. He also had 15 horsemen, which meant that he was left with approximately 60 men to fight 400 soldiers. Dumont, who was still in pain from his wound at Duck Lake, inspired the remaining Métis to fight on. The Métis kept the Canadian troops from advancing all day. As the battle raged, the Métis sang Pierre Falcon’s songs to keep up their courage. When they were down to only seven cartridges, Dumont set fire to the prairie grass, sending thick clouds of smoke towards Middleton’s troops. When the wind shifted, he then returned to his 15 horsemen after trying to get back to the rest of his main force in the rifle pits. He returned to find that the Dakota had retired from the fighting. It was at this point, only seven men remained with Gabriel Dumont, that reinforcements came. Édouard Dumont, along with Yellow Blanket, Ambroise Champagne and 80 horsemen arrived to reinforce the Métis’ beleaguered position. Marguerite Caron, wife and mother of some of the participants, had compelled Louis Riel to send in the reinforcements. With this new cavalry complement, Édouard Dumont led a charge that forced the Canadians back. This action led to Gen. Middleton’s decision to withdraw, which ended the battle. On the Canadian side, 10 men were killed and 45 were wounded, while the Métis suffered the loss of four men, one being Gabriel Dumont’s nephew, Pierre Parenteau. Three Métis were wounded, one mortally. They also lost 55 horses in the battle. The Métis picked up 32 Canadian carbines, and at first light, rode back to Batoche to prepare for another battle. 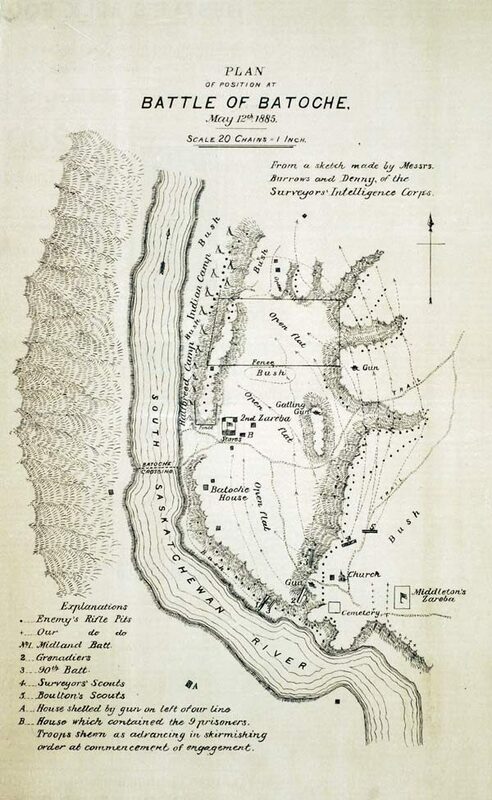 Plan of position at the Battle of Batoche from The Canadian Pictorial & Illustrated War News . After the previous battles of Duck Lake and Fish Creek, the Métis decided to make their stand against Gen. Middleton’s forces at the village of Batoche. They dug a series of defensive rifle pits, or trenches, around Batoche’s perimeter. It was a battle of attrition, which only ended after the Métis became exhausted from fighting and ran out of ammunition. Gen. Middleton reached Batoche at about 9 a.m. The Métis started firing from the first two houses of the eastern branch of the Humboldt Trail, which was about 350 metres from the church and the rectory. Middleton fired a Gatling gun — on loan from the American army — on the first house, and a gun from his force’s “A” battery shelled the second house, causing the Métis to scatter. Both houses burned to the ground. The Gatling gun was also fired on the rectory, and one of the bullets went through the wall and hit Father Moulin in the leg. After 9:45 a.m., the firefight continued between the Métis and Middleton’s men. The North West Field Force made it to Mission Ridge on the first day of battle, but they did not regain that ground until May 12. Middleton decided to pull back his best soldiers, the grenadiers, from the firefight. He used the Gatling gun to hold off the Métis fire. No one was killed during this first attack. On the Métis side, Élie Dumont and others tried to encircle the North West Field Force to capture the Gatling gun, but were unsuccessful. They tried a second time, only to ignite a prairie fire. The fire almost cut off Middleton’s supply line, before burning out. On May 9, the fighting ended at around 3 p.m. Middleton had a zareba, a defensive enclosure that is meant to protect supplies and combatants from enemy fire, built during the afternoon. Built on high ground, the zareba was used to protect Middleton’s men at night, while also being used as a daily base of operations. It prevented any possible surprise attack from the Métis. At 6:30 p.m., the Métis advanced again, while the North West Field Force moved back to the zareba. The Métis and First Nations fired shots into the zareba every 10 minutes for the entire night. During the morning of May 10, the soldiers were ordered to dig rifle pits between the zareba and the cemetery. At 5 a.m. Middleton’s troops hoped to demoralize the Métis by firing heavily at them from all positions. In the afternoon, Middleton ordered his men to dig their pits even deeper. His goal was to prevent the Métis from using the same tactics on the zareba as they had done the night before. The troops withdrew at 6 p.m. under heavy fire, having been kept from the ground that they had previously gained a day earlier against the Métis. On May 11, Middleton left at 10 a.m. and rode north of the zareba to Jolie Prairie. The Métis fired on him and his men from their rifle pits. Middleton ordered the Gatling gun to be fired to stop the Métis from shooting. Before going back to the zareba, the soldiers burned down log houses that the Métis could have used for shelter. Those Métis who were positioned by the cemetery moved north to meet Middleton. This allowed the North West Field Force to advance farther. The Métis did not fire at Middleton’s camp that night. At this point, Middleton was informed that the Métis were running out of ammunition. He therefore decided to try to win the battle the following day. By the next morning, only 50-60 Métis were still fighting from their original force of 250-300. They had only 40 rifles, with the rest using double-barrelled shotguns. Some Métis were using nails and spent bullets for ammunition. Early that afternoon, the North West Field Force broke through the Métis’ frontline rifle pits. The Métis valiantly fought against this advance, but succumbed to the onslaught. The Canadian soldiers bayonetted some Métis, including several elderly men such as 93-year-old Joseph Ouellette. About 25 soldiers who were being held captive by the Métis were then released. At this point, with the conclusion of the fighting, the Métis women, children and Elders emerged from their hiding places in caves along the riverbank. The armed Métis resistance had concluded. The Métis would continue their resistance by different means in the future.